Bringing your data to you. Our innovative products and services allow you to track your assets from anywhere. 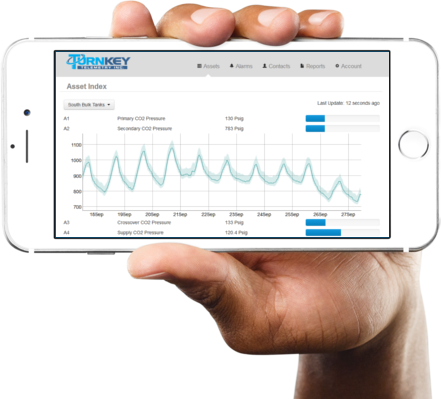 Turnkey Telemetry brings your data to you. With one of our devices in your system, you'll have access to your data from any computer or smart phone. Unlimited data storage. Unlimited phone, text, and email alerts. Unlimited access. All of our hardware products use low-cost cellular connectivity. Simply install one of our products on your remote asset, and you'll be able to monitor it from anywhere! See below for a live demo. Our capacitive liquid level sensors let you know exactly when a customer needs gas, eliminating both wasteful milk runs and embarrassing runouts. 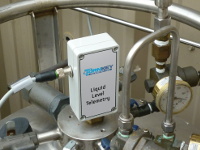 Our low-cost cryogenic liquid level sensor installs from the dewar top into any standard can, giving a reliable and accurate liquid level reading with no moving parts. Compatible with Carbon Dioxide, Nitrogen, and Argon. Remote display and pressure sensors are also available. We also have products specialized for gas cylinder pressure monitoring of essentially any gas. 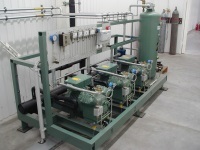 We specialize in monitoring mission-critical industrial gas supply systems. Our hardware can interface with standard industrial sensors for liquid level, pressure, differential pressure, temperature, pH, flow rate, and even mix analyzers. With Turnkey Telemetry monitoring your industrial gas system, you get notified of gas anomalies before they become a problem. Our products easily integrate into most industrial systems. PLC interface is also easy. By adding Turnkey Telemetry into your application, you'll have instant access to your sensor data from anywhere. Because of our unique cloud-based system, our solutions offer substantial advantages over typical embedded PLC cell modems. All of our telemetry products and systems are designed and built in-house. We can create a specialized telemetry system for your OEM product, allowing you or your customers remote access and control in almost any application. We can also offer white-labeled products and service for your unique application. Here are a few applications that our customers have used our products for in the past. Monitor gas on customers' sites to prevent runouts. 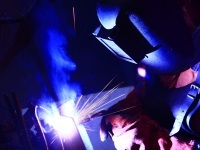 Provide welders and laser-cutters with high-quality supply. Monitor and control HVAC settings from anywhere. Ensure regulatory compliance with continuous monitoring. Monitor temperatures of pharmaceutical products. Record livestock feeding or drinking habits. Monitor and remotely control grain dryers or irrigation systems. Record weather patterns at remote sites. Supervise industrial machinery for performance and wear monitoring. 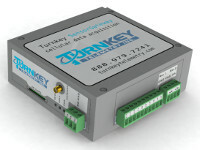 The Turnkey SensorBridge™ connects up to 15 analog and 7 digital sensors to our cloud-based service. You, your colleagues, and your customers can easily access and analyze your data. We provide unlimited alarms and alerts at no extra cost. Standard features include cellular connectivity (1 update every minute), SD card logging (1 update every second), remote controlled outputs, PLC interconnectivity, and easy online configuration. Our capacitive liquid level sensor installs into the top of any standard dewar can. It is great for monitoring CO2, Ar, N2, and other cryogenic gasses. Remote display and pressure sensors are also available. The sensor features a built-in cellular modem and antenna. Simply install into your can, power on, and you're done! All configuration is done via our website. 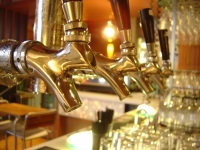 Our sensors are priced competitively even in the low-cost beverage gas industry! 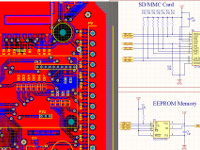 We specialize in custom hardware design for OEM applications. We can design various products from industrial machine monitoring to agricultural water usage measurement. All of our design and manufacturing is done in-house, so we can offer substantial discounts for large quantities. Call us today and let us quote your project. Here is live data from one of our customer's factories (used with permission). Click a sensor heading to see historical data - drag over the graph to see minute-by-minute data. All of our products and services are designed and built in-house, right here in the Midwest. We store sensor data securely in the cloud. There's no need to worry about server configuration or maintenance. You and your customers can configure unlimited alarms to alert you of potential problems. Alarms can dispatch by text, email, or automated phone call. Our process is fully automated. Device configuration is done from our customer portal. There's no need to wait on support personnel to implement a configuration change. Our cloud-based solution makes it easy to share data and collaborate with colleagues and customers. All of our hardware devices undergo a substantial testing and burn-in process before being shipped. Our servers are constantly monitored for issues and have had 99.95% uptime over the last 4 years. With our system designed and built 100% in-house, we've retained complete control over costs to bring you the best performance at the lowest price. 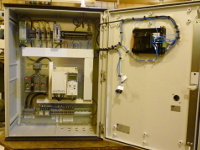 We can provide complete systems including auxiliary components such as sensors, relays, and operator interfaces. Have a potential telemetry need? Please give us a call or email today, and let us figure out how we can help you. © 2017 Turnkey Telemetry Inc. All rights reserved.